This is our "Home Page". You'll discover the page to be rather static with only minor changes over time. The Header will probably be changed when you have seen enough of Peach. Will be nice to put some photos of beautiful environments we certainly will come across during our journey. You may feel the information below on Peach to be poor, well, all is on purpose. We are not yet ready to get into detailed descriptions on everything and perhaps we'll never be. The Update pages will be our communication platform where we will post, hopefully, text of interest and excitement. Anyway, let us present the crew. Göran is the Captain and Karin is the First Mate. Occasionally we are visited by our daughter, Jessica, which gives us a Crew Mate to do the work. Our Yacht, a Hallberg Rassy 382, has been upgraded during the years and we trust her completely. 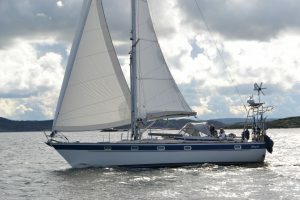 She has proven herself through sailings across the North Sea a few times as well as south to the Channel Islands. Finally all preparations have been made. The EchoTech watermaker and the selfsteering unit, the Hydrovane, got installed and not to mention all supplies carried on board. We were ready for our sailing to a warmer climate. The date was 06.07.2017 at 1 pm when we left our marina, Krossholmens boat club in Gothenburg, Sweden. Even if we are on a world tour we plan regular visits to Sweden and the first one will be in October this year. Currently we are back home while Peach is resting in Panama. Follow our journey on the "update" pages.